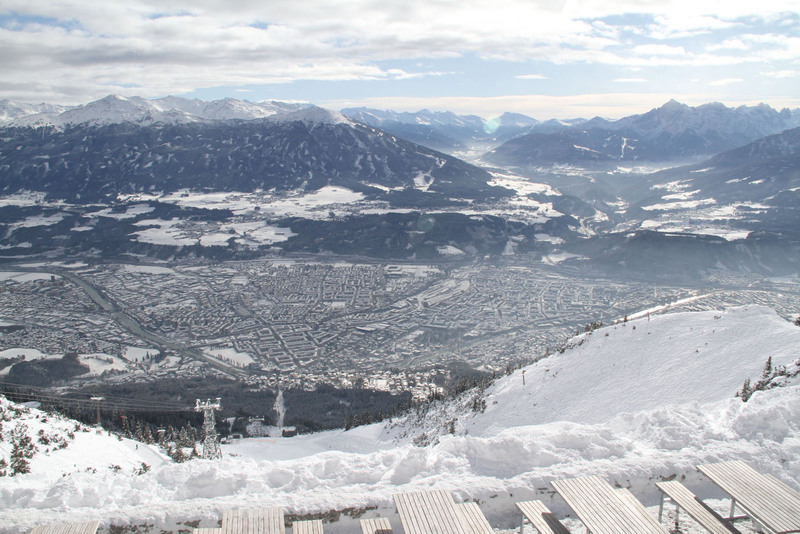 Nordkette is an amazing little (big mountain) Austrian ski area, in the heart of the city of Innsbruck, this challenging ski terrain towers above the historic village. A ski funicular starts downtown, just a ski boot stroll past Saint Jacob’s Church and the centuries old Golden Roof, which feels so wrong its right – carrying your skis through history. 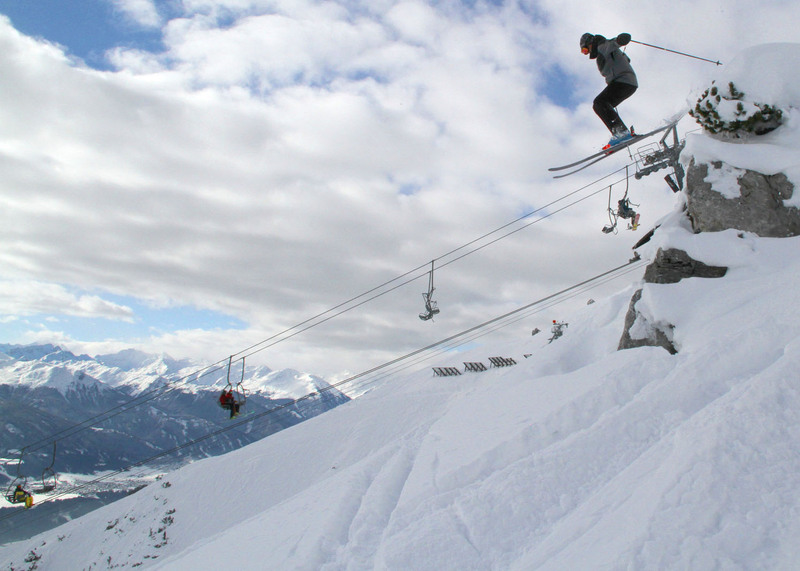 Nordkette is called Austria’s Jewel of the Alps, as its ski slopes sparkle above Innsbruck’s palaces and church steeples, you can even spot the Nordic Olympic jump across the valley at Nockspitz. 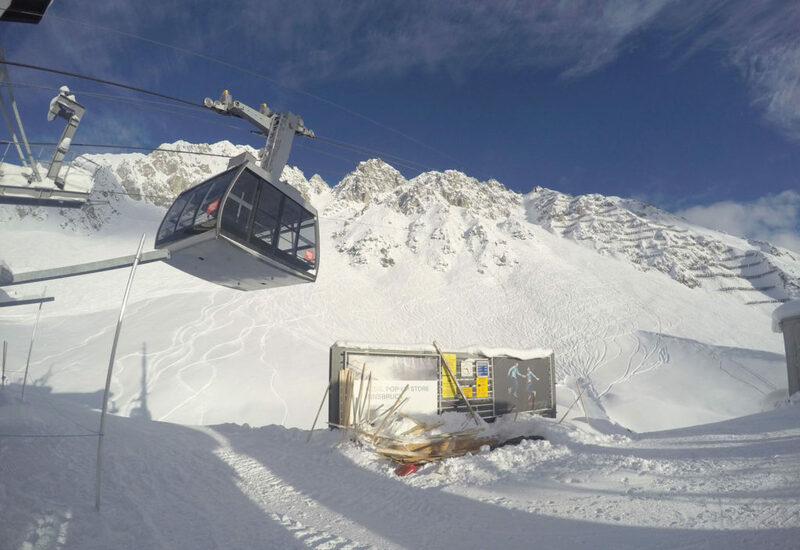 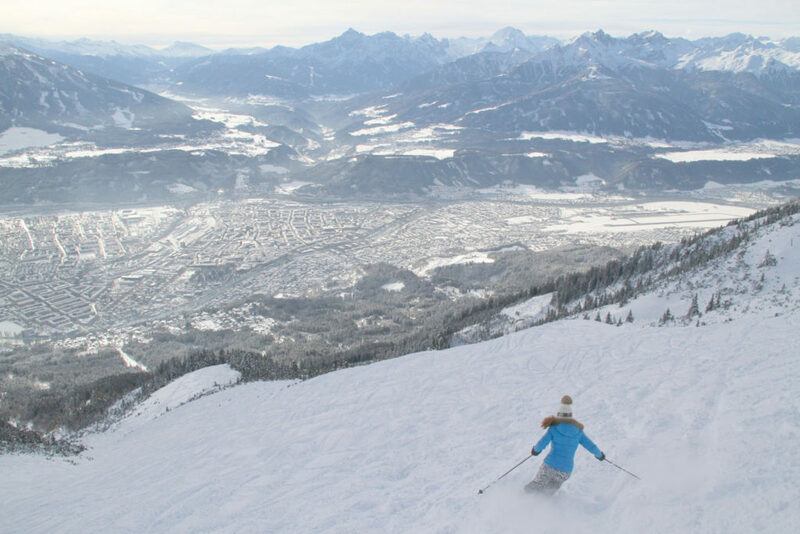 Nordkette rises steeply above Innsbruck, accessed by three amazing lifts – from the Funicular Hungerburg to the Seegrube Tram and finally the Hafelekar – a single cable car to 7,400 feet reaching a free skiers paradise. 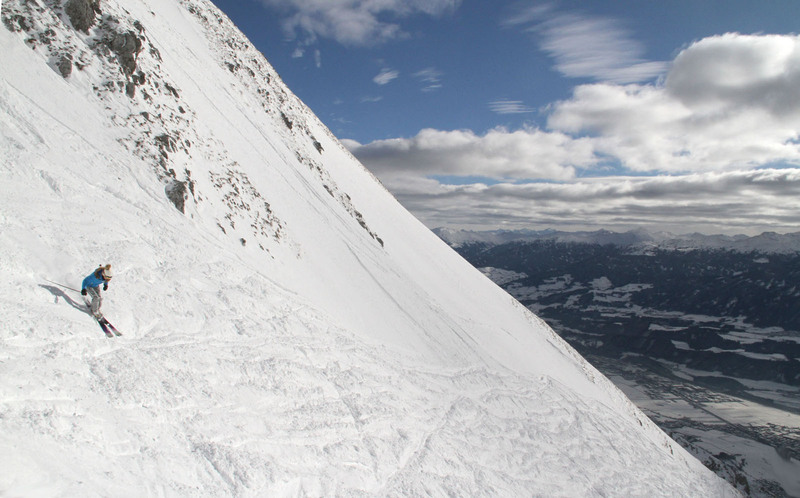 The architecture of Nordkette’s lifts, dating to the 1920’s, is extraordinary, recently updated by Zaha Hadid. 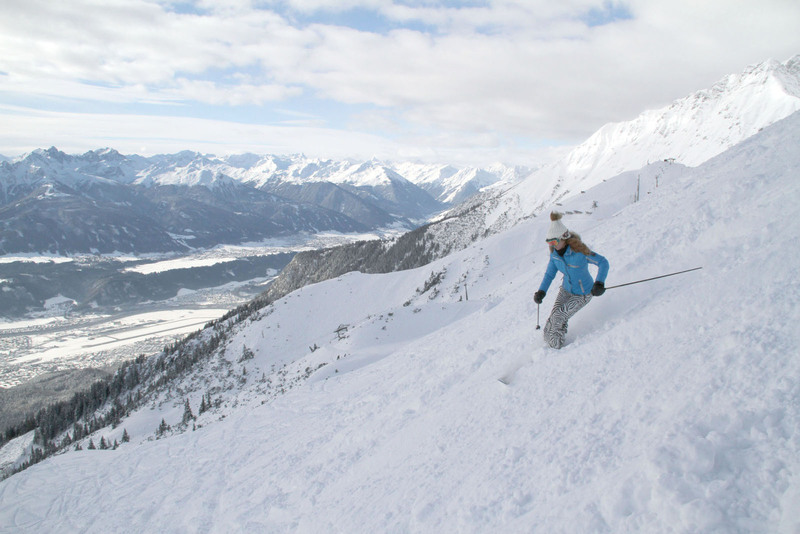 Nordkette also hosts Austria’s largest nature park for sightseer who don’t bring skis –which accounts for up to 85% of the lift riders. 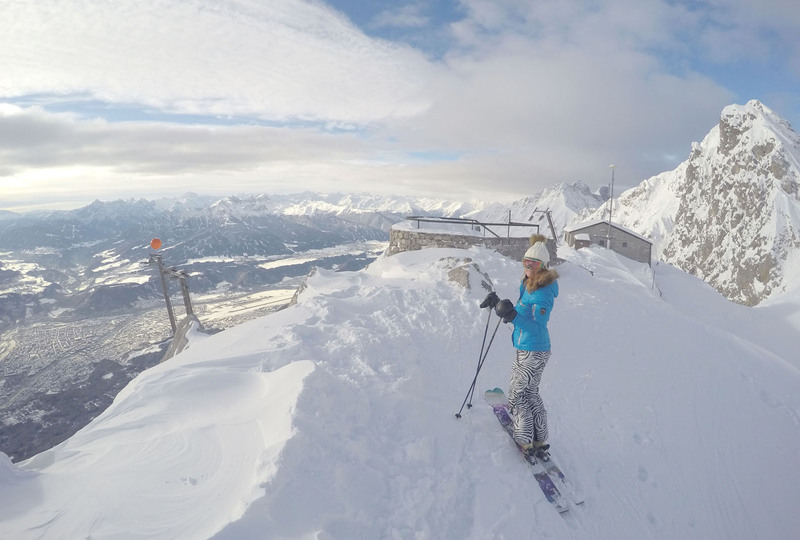 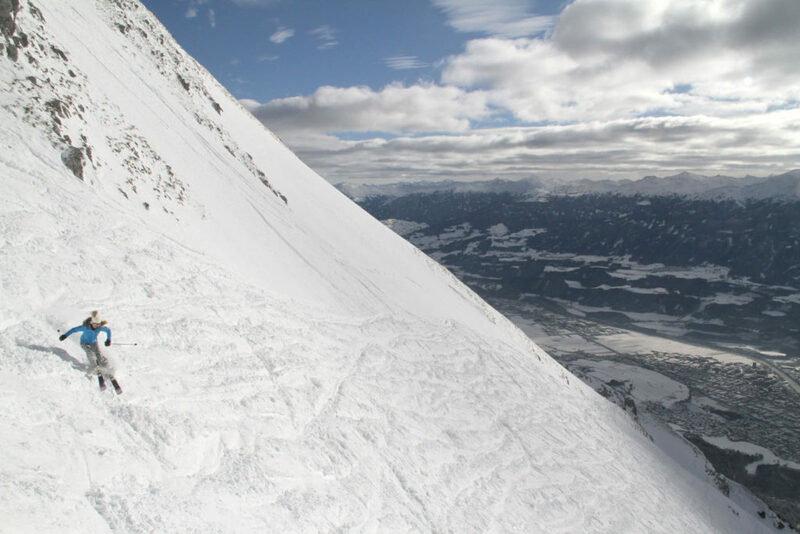 Otherwise Hafelekar is all expert summit terrain, arguably the steepest in the Alps with just two controlled and monitored routes, everything else is “ski it if you dare” NFT- no fall terrain, with views to Germany’s Bavarian Alp and dropping, literally, to Innsbruck below. 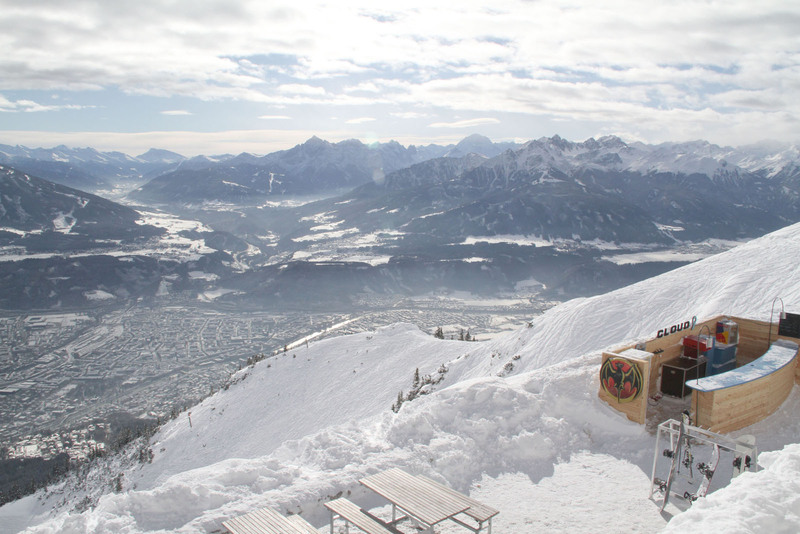 With a quick hike you reach “scare the schnitzel out of you” chutes, big bowls of extreme, natural, untouched, untamed steep skiing. Nordkette skiers be warned, and walkers planning to explore this nature park terrain at Hafelekar, its precipitous and unmarked in winter, as the danger signs indicate. 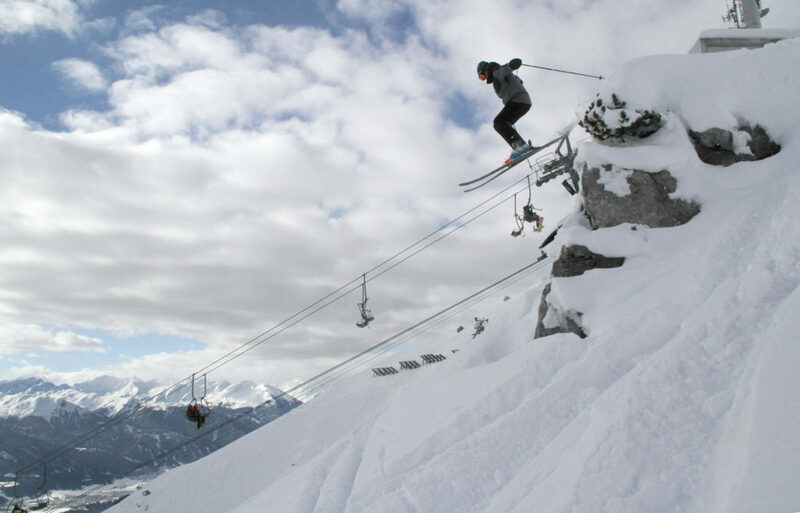 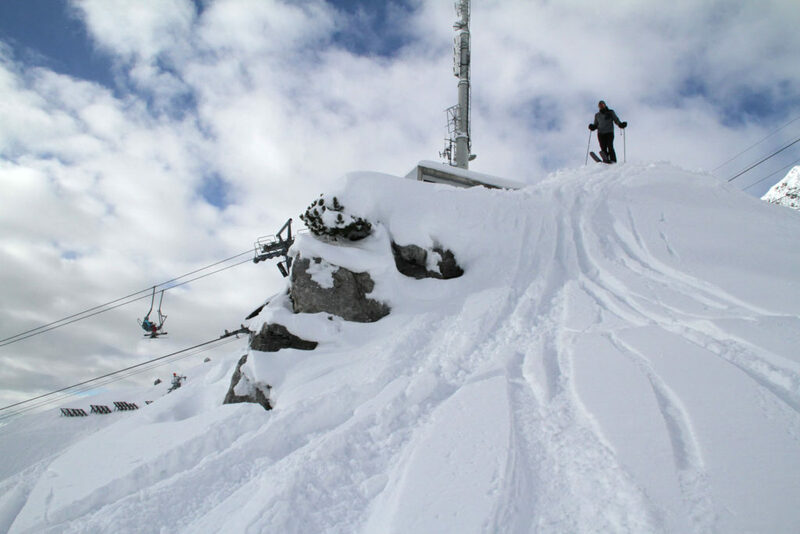 For tamer ski terrain, Nordkette’s mid-mountain Seegrube is a white wonderland, with a terrain park and 5 prepared ski trails, served by two chairlifts. 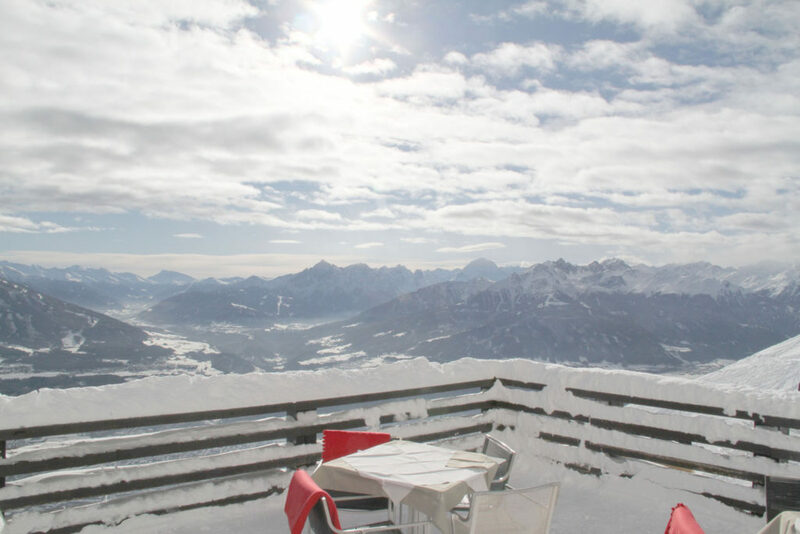 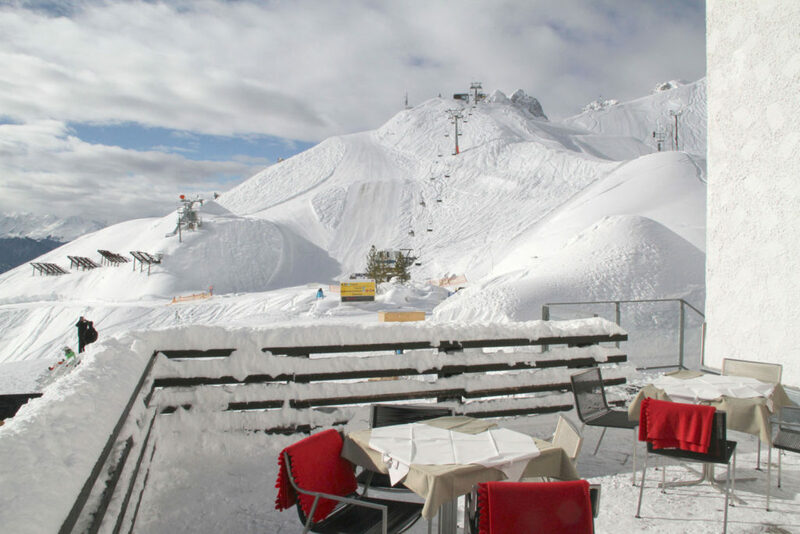 For a spectacular lunch, Seegrube’s Alpine Lounge is super-scenic, as is the Cloud 9 outdoor bar and sun terrace. 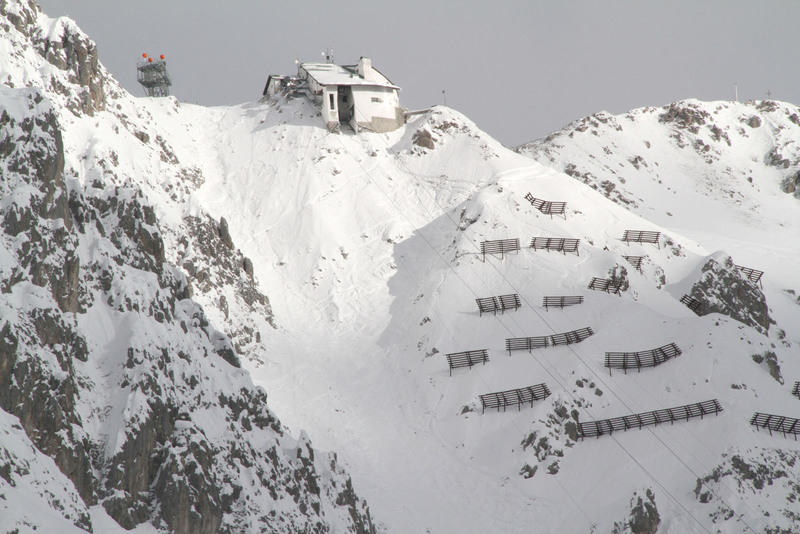 There’s even an Iglu- the largest in the Alps. 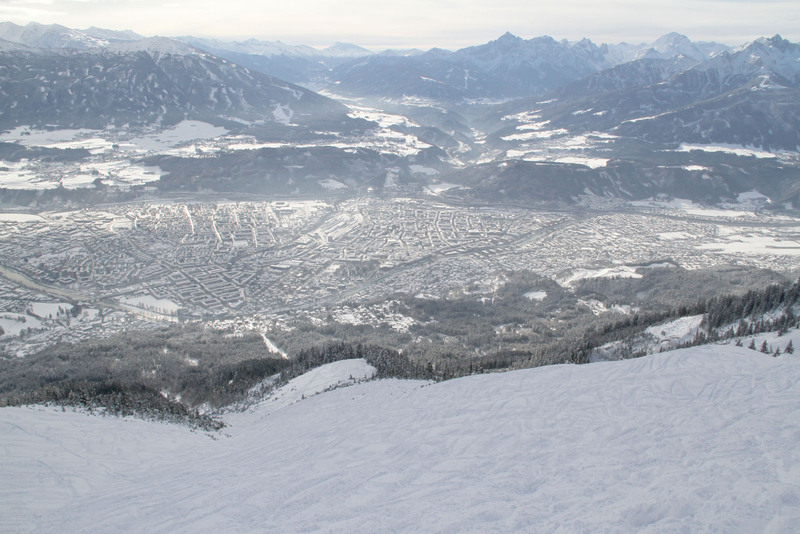 Seegrube’s terrain is open for night skiing – which must be extraordinary as you look down on the lights of Innsbruck. 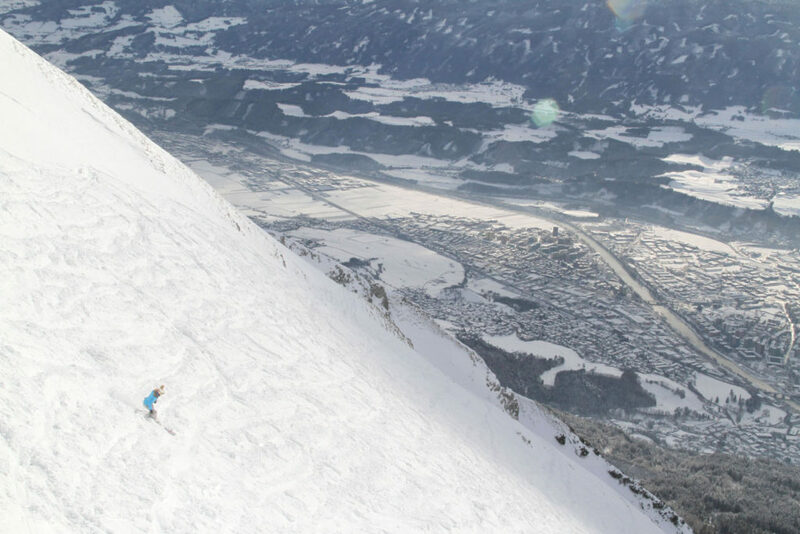 There’s not a ton of skiing at Nordkette, just 5 prepared trails, but the off-piste is off the charts, steep rivaling Verbier (just not quite so much). 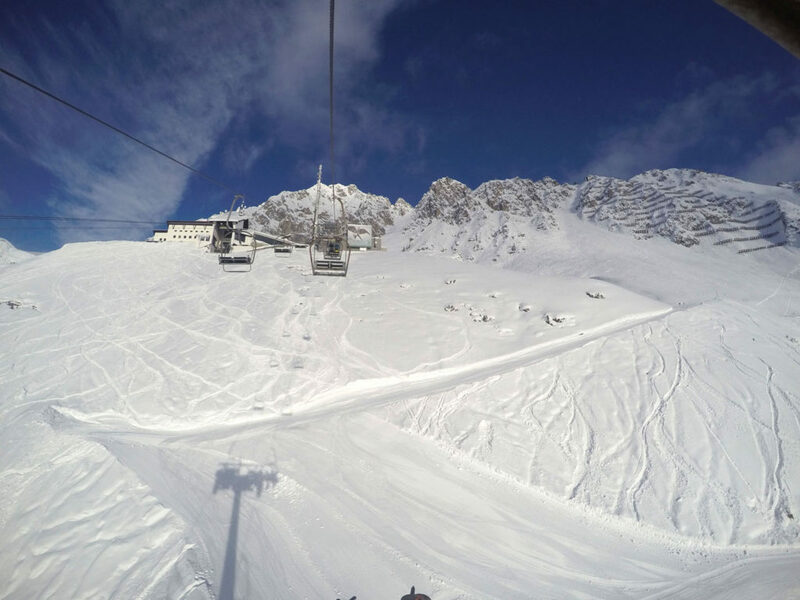 To end your day skiing at Nordkette, download, or take the longest of Nordkette’s runs back to the funicular for your ride back to Innsbruck. 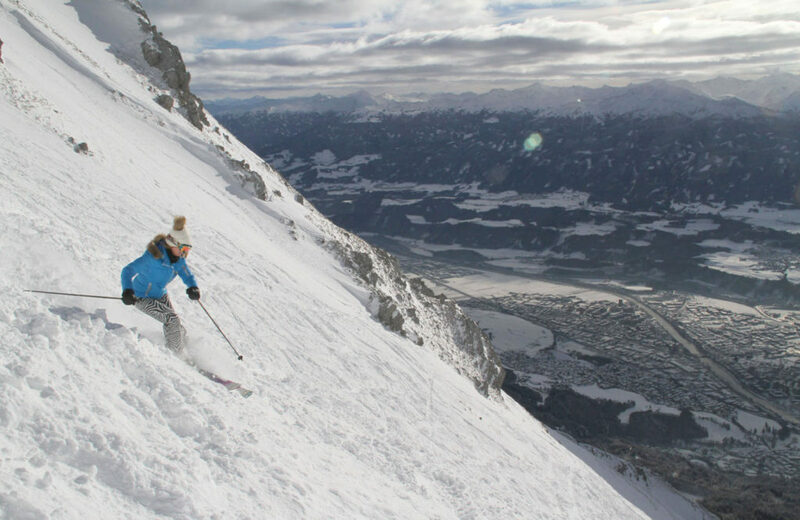 We loved Nordkette for the views, the serious vertical skiing down to Seegrube’s base, and the crazy steep terrain (confession) but we are expert skiers. 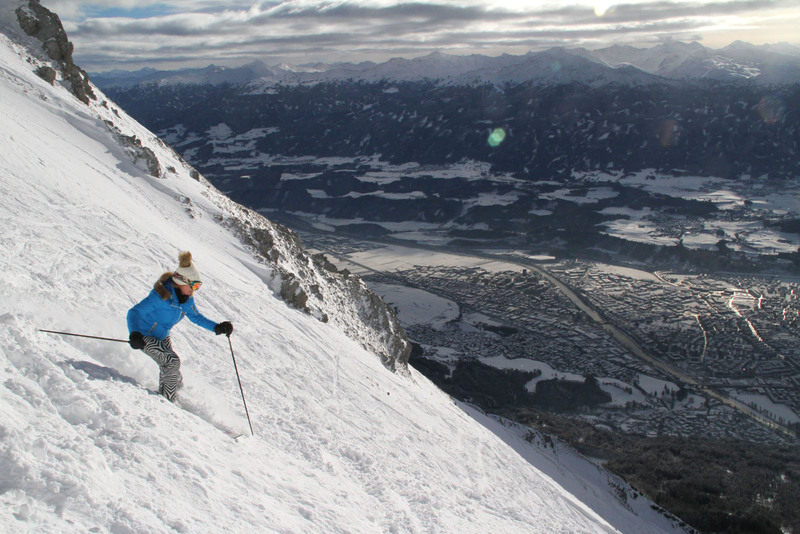 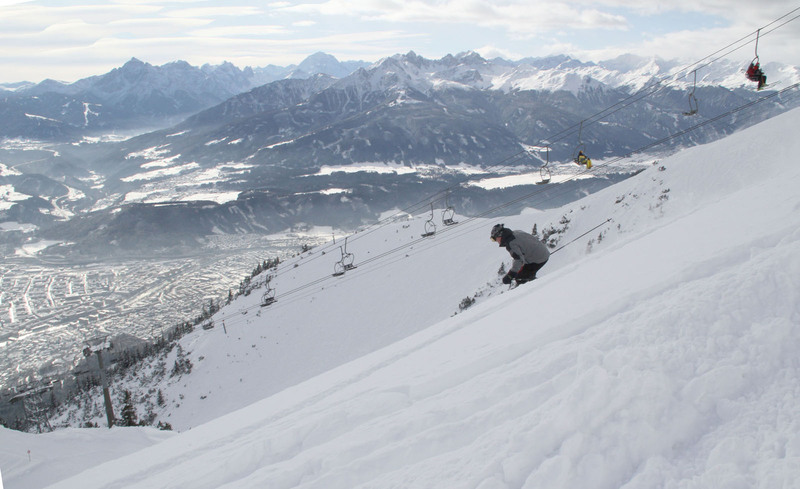 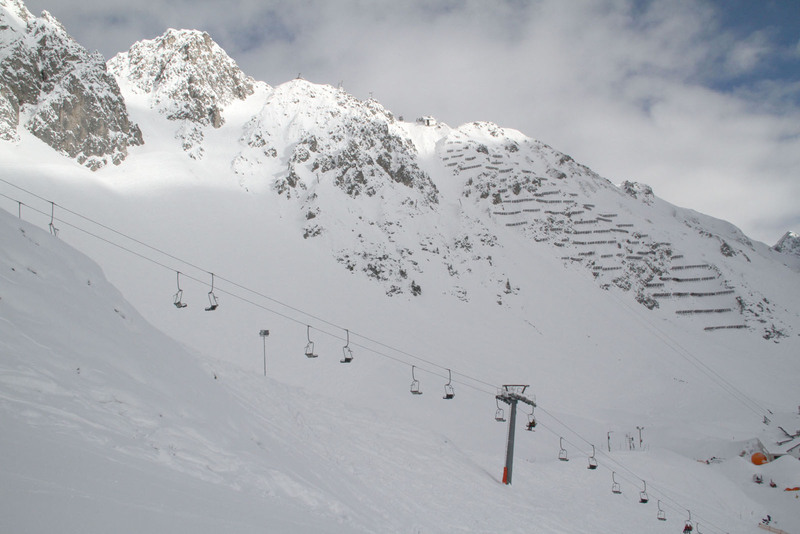 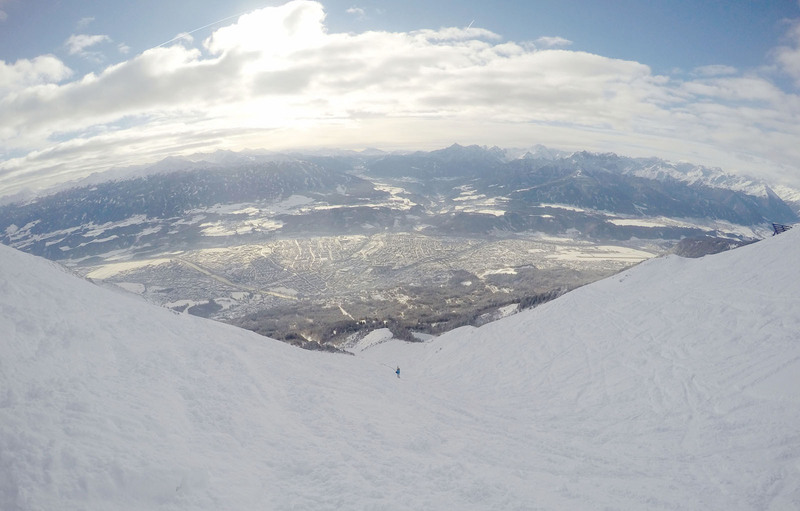 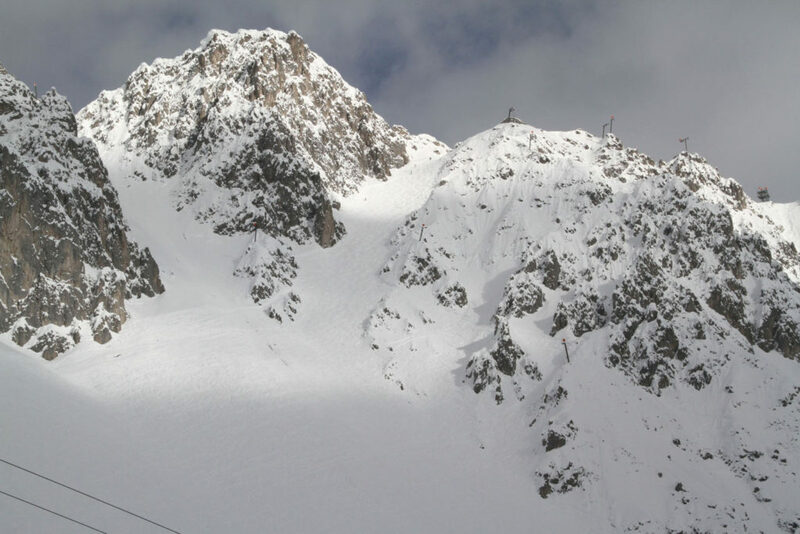 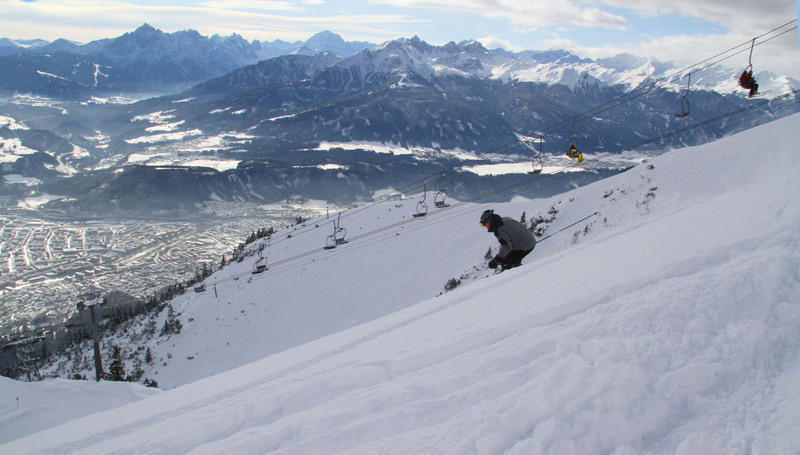 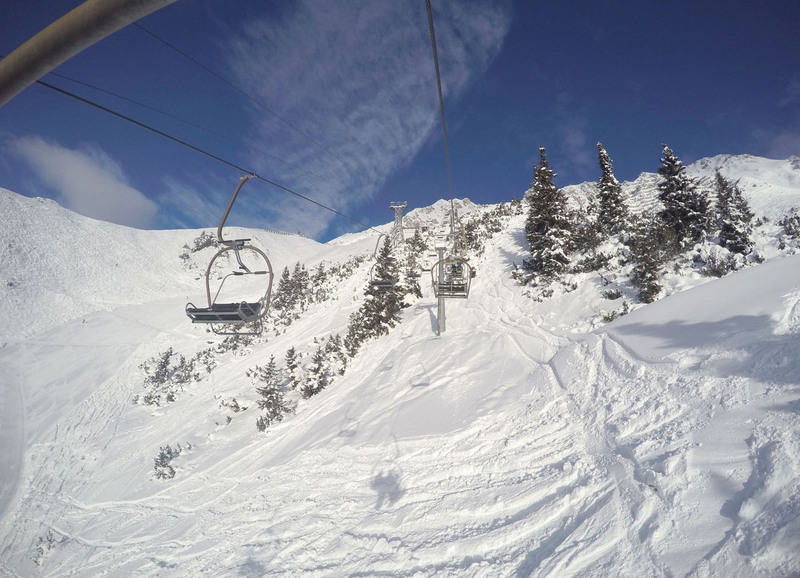 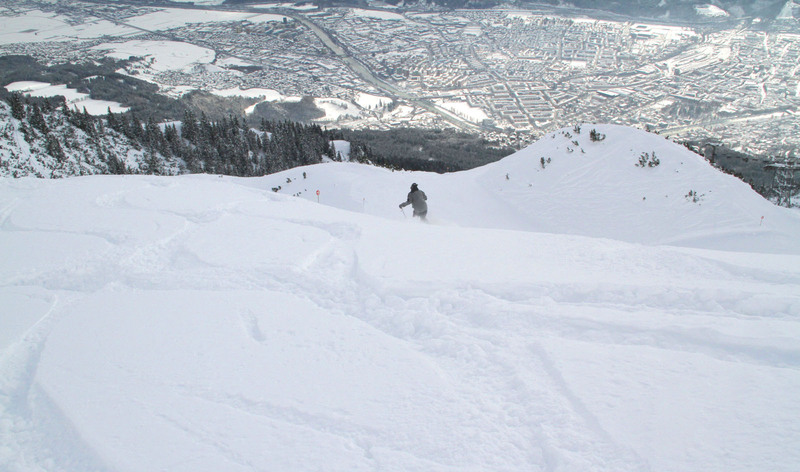 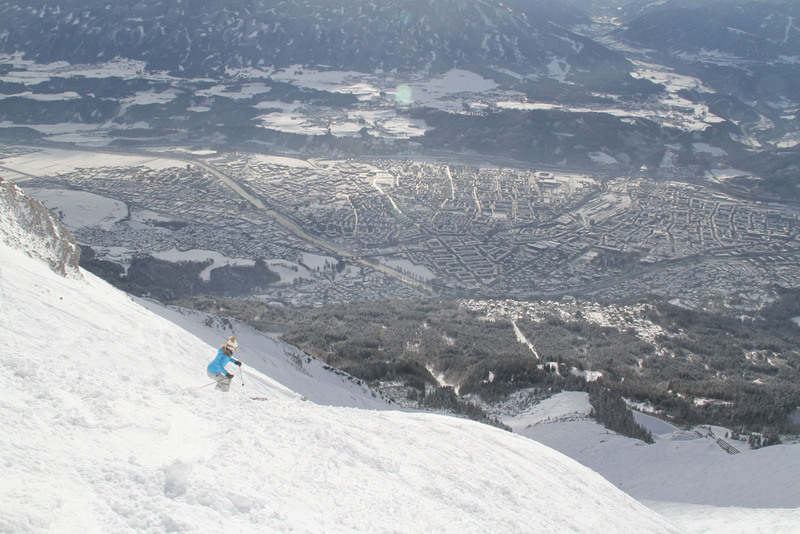 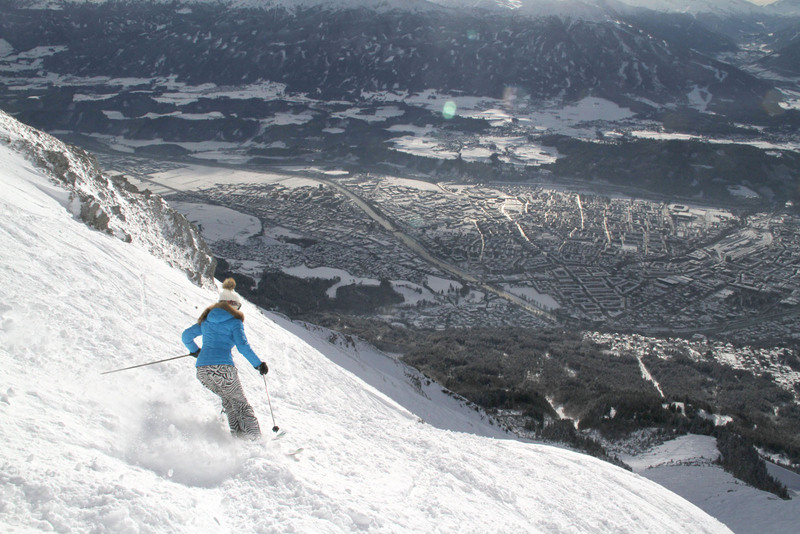 Other worthwhile Innsbruck ski areas to visit include Stubaier Glacier, Kühtai, and Axamer Lizum.